March 2019 - New original dips tunes, exciting upcoming gigs, and a brand new LOGO!!! Designed specifically to mimic the vintage San Francisco signs of our beautiful city - safe to say we dip this one hard......! Get cha dips! Hot Dips here! September 2018 - More fresh dips on our youtube account! Click "Subscribe Here" above to be directed to our youtube channel and three brand spanking new videos from our Great American Music Hall gig. Featured recently is our newest original entitled "Heart of the City" which is an 8-minute heater full of harmonica tones never heard before! May 2017 - We've surpassed 4,000 likes on the mighty dipbook! Thanks to all the dippers and dippettes who have supported us with "Hot Dips!" or "Fu@$ You Dennis!" chants over the last year and a half, and especially to those that have spread these dips to their friends... this is what it's all about. New dips music is heating up!! Jan 2017 - In time for the new year we've prepared some live footage from our most memorable show of 2016, the infamous Mad Alchemy Analog Liquid Lite experience on Haight St after Hardly Strictly Bluegrass fest! Never before have we felt more in tune with the jam-rage than getting weird with our friends under an epic light show on the street where the weird began. Cheers to so many amazing experiences in 2016 we shared with all of you, whom we cherish as much as a freshly stirred hot dip! Sept 2016 - Fresh dips here!! You should probably subscribe to the dips youtube account, home of the freshest dips there ever were (and ever will be, from now until eternity). It's pretty serious. Only experienced dippers should subscribe. We have Dip Down footage and recent gig's uploaded already with the epic Slim's show soon to come - Keep on dippin all! 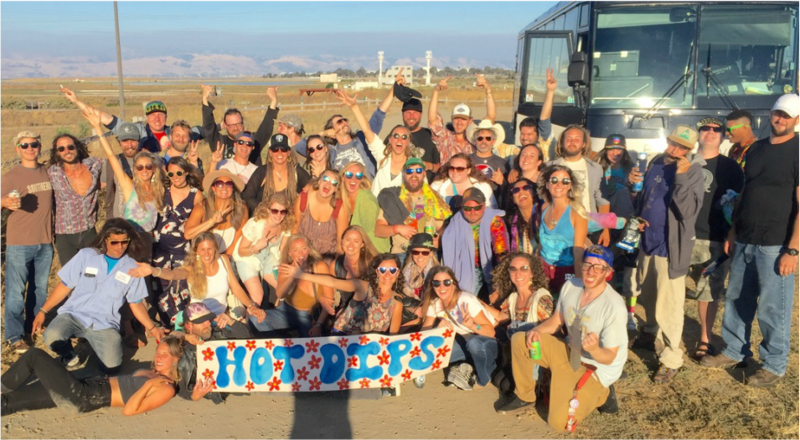 Aug 2016 - Hot Dips camp continues to grow.. this year's campsite at High Sierra Music Fest was bigger than ever and featured a dippified (aka severely amplified) pop-up set which was later continued on the Dead & Co "Hot Dips Express" party bus - so. many. dips. Also on the horizon is our very first gig on the famous SLIM's stage and we can not wait to show them how we dip-down Aug 26th! We are happy to welcome back Eileen from Totally Dead to sing with us on this special occasion - come get these dips! June 2016 - We'll see you all on June 8th as we open for some more distinguished deadified musicians at our favorite venue, the Boom Boom Room! The headlining act features none other than Jay Lane (Primus & Ratdog), John Paul McLean & Dave Hebert (of Melvin Seals & JGB) with our pal Jordan Feinstein (Stu Allen) .. can it get any better? May 2016 - Our 3rd Annual Dip-Down was the best yet... we raised $1,870 for the wonderful Mama Hope charity!!! Dips were had, the music was top notch and even our neighbors joined in with the fun! We can't wait for next year. HOT DIPS! April 2016 - Fresh off some great shows with the likes of Jason Hann (of String Cheese Incident) and The Highway Poets, the dips are thoroughly stirred and reaching their boiling point. What does this mean you ask? New music is on the horizon! We also have a Cinco de Mayo rager happening at Boom Boom Room followed by the 3rd ANNUAL DIP DOWN on May 15th for Bay 2 Breakers! Mmhmm.. sweaty costumed dips. Dip Well Friends! February 2016 - It is without further adieu that we present the Hot Mountain Dips website in conjunction with our most exciting show announcements to date! Check back with us regularly as we finish construction of this heavily dippified site for more gig announcements and everything else hot dips!! In DIPS we trust.